We all know books are special but an Argentinian Children’s Publisher have truly put the magic into one of their books. 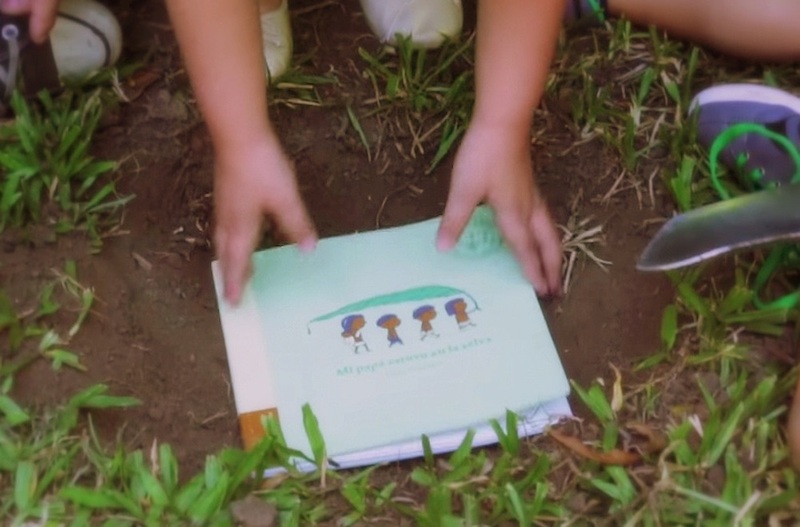 In an attempt to teach children the origins of books – trees – they have created a hand-stitched children’s book into which Jacaranda seeds are carefully sewn. 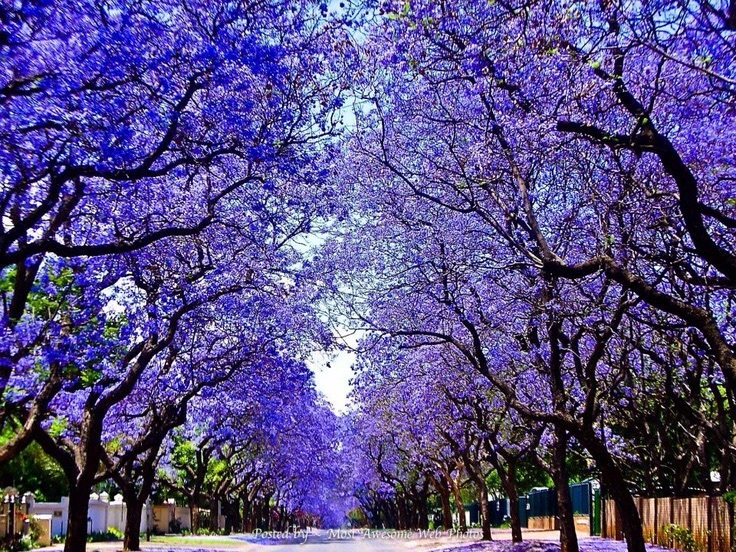 Once the book is read, it is buried and within seven to fourteen years the beautiful purpleblue blooms of the Jacaranda tree will flourish. ‘Mi Papa estuvo en al selva’ (‘My Daddy was in the jungle’) is hand made on acid-free paper, uses ecological ink and is finished with silk. The story itself follows a father’s adventures in the South American jungle and is aimed for the 8-12 age group, although it can obviously be read to younger children. 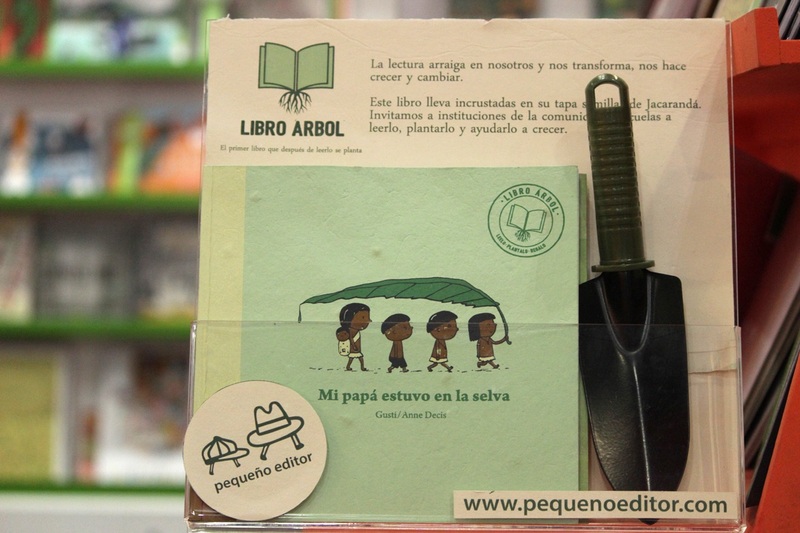 Pequenos, the publishers based in Buenos Aries, believe that ‘trees and children can grow together’ and with this book they have successfully achieved the world’s first truly recyclable book whilst teaching children about ecological responsibility. The book caused a sensation when launched earlier this year, gaining not only national but also international notoriety. 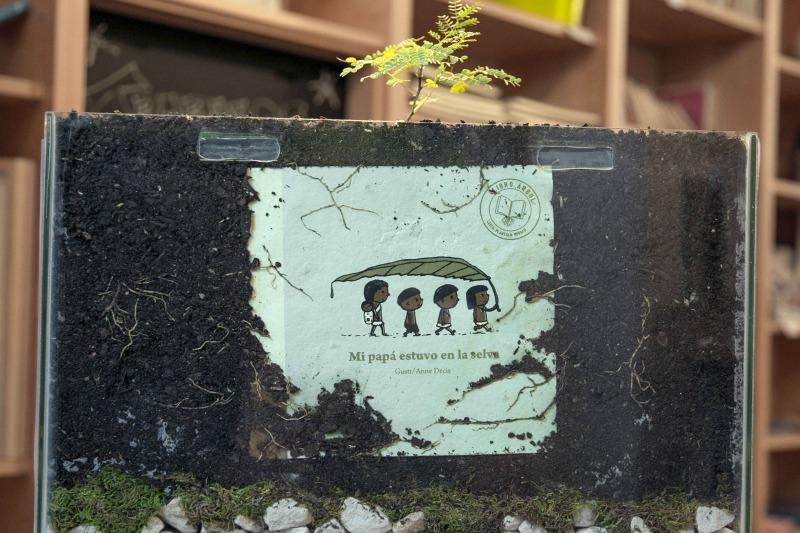 Some bookshelves promoted the books by half-planting them in soil and allowing the seeds to germinate – a spectacular and thought-provoking sight and visualising the novel concept of not only do books come from trees but trees come from books. Please do take a look at their promotion video which also shows the book production. Such a great idea, and perhaps one to try and follow. I can’t think of a tree from this part of the world that has small enough seeds; it would be hard to sew acorns into the lining! It also has to be a tree that doesn’t grow too big, and preferably one with flowers. Any ideas? I agree Peter, I tried to think of seeds of tree for the UK that would work but without success. Flower seeds would grow but fail to make that vital tree, book, tree, connection. Maybe we will have to leave it to the Argentinians. I had to look up photos of the planted and sprouting book tree – so cool. So glad you liked it, Eve. I do hope the photos on the post here showed up okay for you? The trees are absolutely glorious. Thank you for the follow and I look forward to following you. What a lovely idea Annika…..then the beautiful flowering trees too! A wonderful teaching tool for children on so many levels. It would make a wonderful birthday present also. If I could just think of anyone having a birthday soon….I would send them this beautiful book with this beautiful thought. It would just ring out “Happy Birthday!” for years and years. Happy Early Birthday Dear Annika! Hope you have a lovely day! Yes I am anonymous in Your blog now…..I am checking into this. 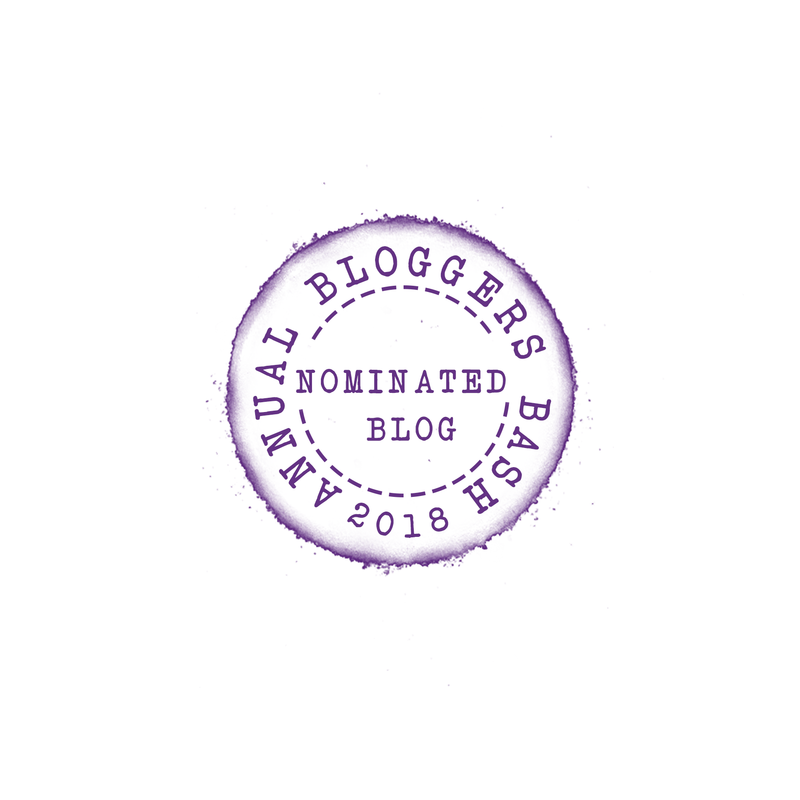 WordPress is helping me reset my name but anonymity can be such fun! Don’t you think? I hadn’t heard about this. What a concept. I can see that being a kindergarten project–plant the book and by 7th grade, students see the results of their effort. Thanks, Annika. What a novel idea (no pun intended). This obviously has it’s flaws but everything has to start some where and who knows where it will lead. This is in itself a great learning process for children (young and old) and thanks for sharing this. Mike, it wouldn’t be you if there weren’t any puns. :-)) I think I would have loved to do something like this with my son when he was younger and I could just imagine his intense excitement. I like that…from small acorns…Thanks for commenting. It is different isn’t it and I like it when people think outside the box. Obviously the publishers would not carry out the project if they didn’t earn on it (and don’t forget the publicity!) but their heart is in the right place. In this highly digital age it has brought out interest for the young about books, nature and the environment. I don’t know the tree policy in South America but know in Sweden for every tree cut down more than one is planted and now the country is 70percent forest – much higher than over a hundred years ago. Many thanks for your comment, so interesting and thought out. I’ve never seen cards that you can plant but love that idea – can imagine that would be very popular. It was fun sharing the post and glad you liked it. Thank you Annika for such a beautiful post to light the Sunday morning. It is a great spirit. So glad you enjoyed this Mirja, a light positive start to the day. Do look at the link as there are many more photos I wanted to add showing the making of the book but it would have cluttered the post. These images are in the video though. This is soo cool. Thank you for sharing with us! It is, isn’t it! Absolutely brilliant. Hope the idea spreads. Wow! This is such a cool idea. I love it. Thanks for sharing this. Thank you Rachel, so glad you liked it. I was so taken with the concept myself.